Hi all and welcome to another week on the Simon Says Stamp Wednesday Challenge. Thank you for joining us for the Anything Goes Challenge and we hope you will all join us again this week too! I LOVE texture on my cards. And to add texture to my card, I used Textured Crackled paste on Funky Florals Mix-ables stencil from My Favorite Things. I love the crackled effect on the texture paste. You can see it on the closeup photo below. To add more texture, I die cut my vellum panels using the Wonky Stitched Rectangle die. LOVE the wonky stitched detail. 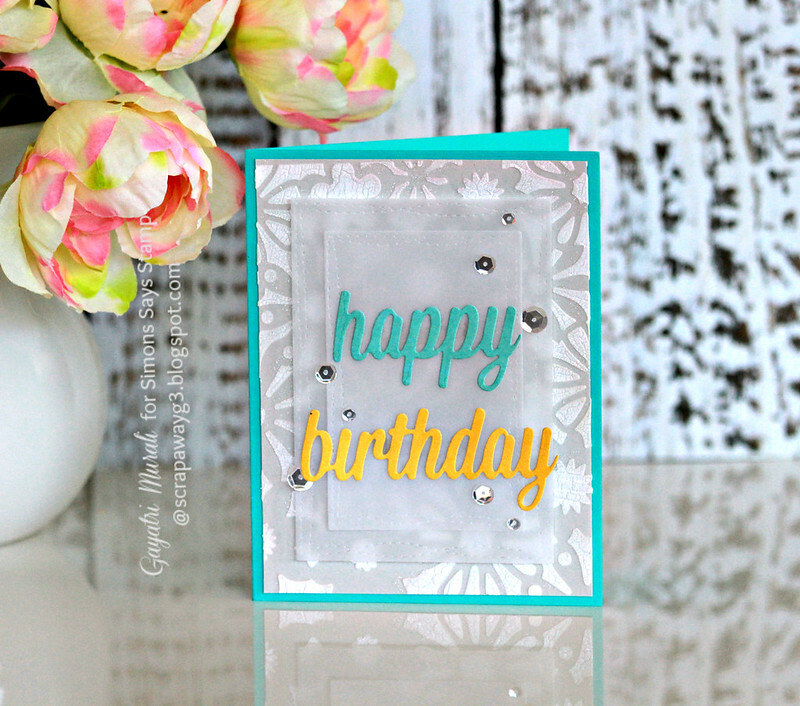 The focal sentiment die is also from an older My Favorite Things die set called Happy Birthday Die namics. 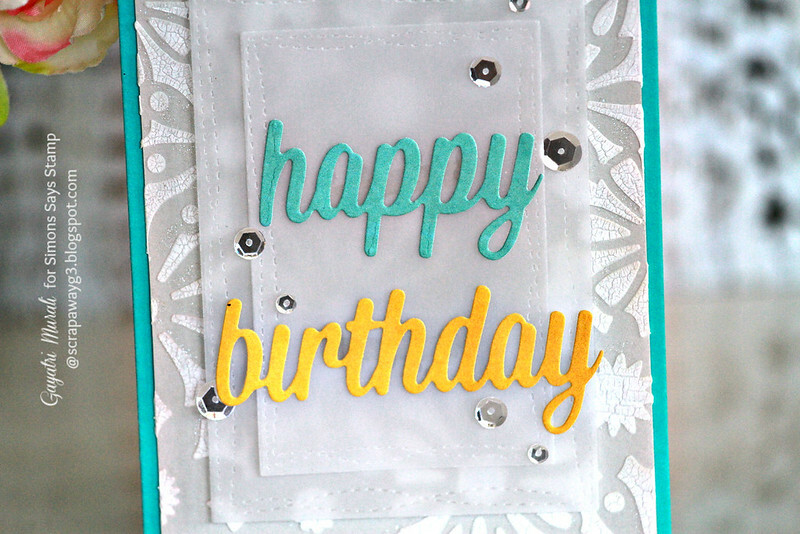 Sparkly Clear sequins brings the card together. 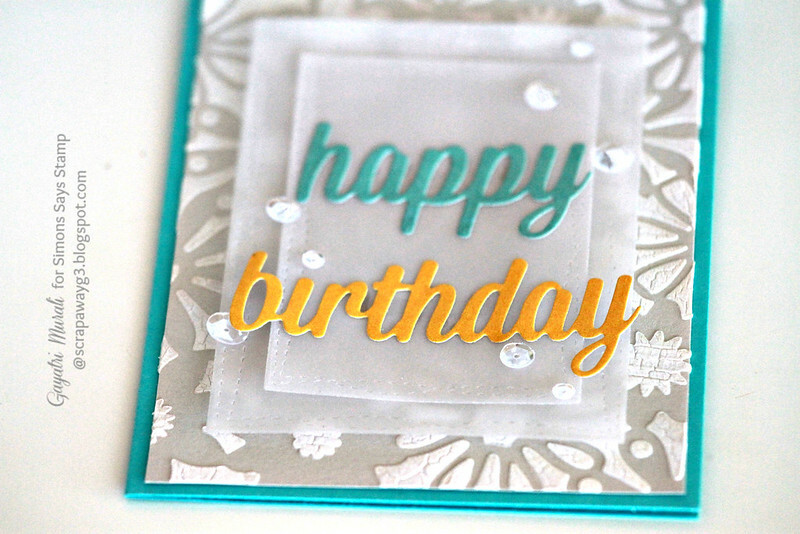 This card is simple yet full of texture and layers. Hope you like it. Wonderful design, Gayatri! You do beautiful things with vellum! Such a pretty card Gayatri, gorgeous design with a super embossed background and super sentiment on the vellum!! So bright & festive–love it! Lovely card. I like the texture as well. I really like the card design. Beautiful card Gayatri! Such a lovely design!! Lovely layers and the color combo is so pretty! Stunning! I love the gorgeous crackle paste background, Gayatri!